Review: "Introitus: Elements" - Sea of Tranquility - The Web Destination for Progressive Music! NOTE TO READER: Forget, for the 66 minutes this disc spins, that "introitus" means "vaginal opening." 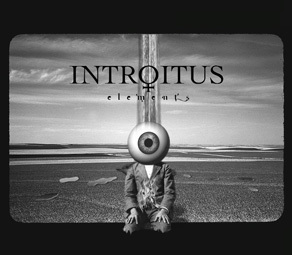 Invoking earth, wind, fire and water, Sweden's Introitus has aptly titled it second album Elements. And this one is a family affair, with keyboardist Mats Bender and his wife, vocalist Anna Jobs Bender, joining what appear to be Bender offspring on drums, percussion, more keys and background vocals. A handful of other musicians also contribute to make Elements a symphonic-prog tour de force. The album contains nine songs: Four short instrumentals titled "Earth," "Wind," "Fire" and "Water," all penned by Mats Bender and wrapped by five eight-minute-plus pieces that invoke the likes of Glass Hammer, Kingfisher Sky and even Pink Floyd. These songs contrast sharply with the elements and embrace a raft of human emotions. "Earth," is a speaker-rumbling treat that segues into the massive and majestic "Like Always," the album's best cut, which begins as a piano ballad. Not far behind is "Soulprint," which closes the album with the thought-provoking line: "You know you'll be alive/Because of the soulprint you left on me." Worth a mention here are guitarist Par Helje's David Gilmour-like solos throughout.